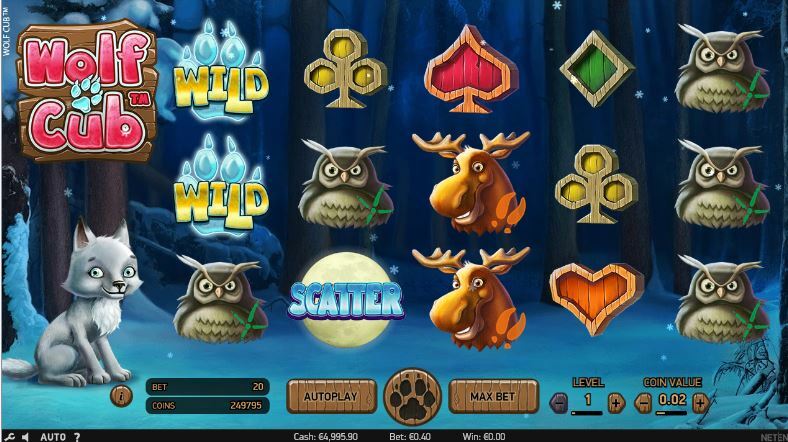 Wolf Cub slot contains yet another original combination of features by Netent and is one of the few games I instantly liked from the first few spins. The theme is cartoon animals of the forest with a twilight woodland scene behind the transparent reels with 5 reels and 20 pay lines. The music is gentle and despite the infantile icons (not up to standard of IGT's Wolf Run or Wolf Rising games!) the graphics are detailed and smooth as we have come to expect from this developer. The game is in html5 format for both mobile and desktop use. The symbols all appear stacked in 1, 2 or 3 rows which means that a full screen of any can be achieved, even scatters as I will come to later! The stacked Wilds are the premium objective paying 100x stake for 5-of-a-kind thus with the 20 lines a base game win of 2000x stake is possible. The Wolf Cub itself pays 30x stake for the same down to the lowest card icon at 4x. The card icons are nicely designed in the form pictures as opposed to letters which adds to the ambience of the theme. There are no random in-play features but single scatters appear on all reels, with an interesting twist! Once you land 3 or more white scatters anywhere in view, they expand and award a number of free games on each position. There are no retriggers possible, but when you realize that each position can award 1, 2, 3, 5 or 10 spins then the total can be substantial - 3 scatters must award at least 9 spins and should 5 land and award 10 on each tile then you could potentially get 150 spins! The enhancement we get is quite good - if a full stack appears on reel 1 and any similar symbol(s) on reels 3, 4 or 5 then all the rows will join up towards to left to award multiple line wins. So let's say 3 Wolf Cubs appear on reel 1 fully stacked, and two appear in the bottom 2 positions on reel 5, then the 2 rows along the bottom will fill with Wolf Cubs between reels 5 and 1. Obviously the same goes for reel 3 or 4 if none appeared on reel 5. The potential is thus full-screen symbols should you get matching full stacks on the end 2 reels! The feature applies to Wilds too.